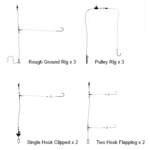 This set consists of a selection of ten rigs: three rough ground rigs, three pulley rigs, two 2 hook flapping rigs and two single hook clipped down rigs. This selection covers a range of different situations which sea anglers will face while fishing around the UK, and buying this set represents a saving compared to buying all of these rigs individually. Further details on all of the rigs included in this set are detailed below. 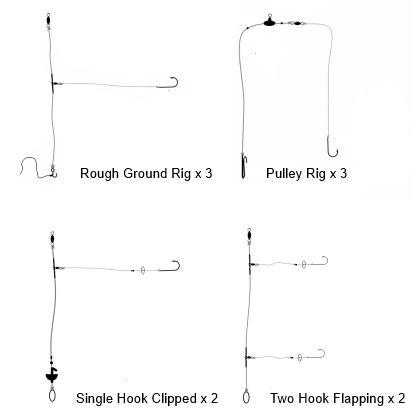 A rig designed for rough and snaggy grounds where tackle losses are likely. This rig features a weak link release which allows the weight to break away from the rest of the rig if the weight becomes snagged. A size 4/0 Cronus Silver Aberdeen hook is also used so the medium to large fish which are found in these areas can be successfully caught. An useful rig for fishing rock marks around the UK. Complete list of components used in this rig: Trace Builder size 1 (large) rolling swivel, Trace Builder size 6 (small) rolling swivel x 2, Cronus black rig crimps x 2, size 4/0 Cronus Silver Aberdeen hook, Cronus weak link clip, Cronus 60lb rig body line (clear), 30lb Sunset Amnesia snood line (clear), 12lb monofilament weak link. This pulley rig is also designed for fishing over rough and mixed ground, although it can also be effectively used over clean ground. These rigs are so called because the work with a pulley action, allowing any fish which are hooked to be pulled upwards and away from the seabed and snags which may be present there. A very popular rig around the UK today, this is made with high quality Storm pulley beads and fitted with a size 3/0 Cronus O’Shaughnessy hooks, meaning that medium to large fish can be caught with this rig. Complete list of components used in this rig: Storm pulley bead, Trace Builder size 3 (medium) swivel, Cronus 5mm beads x 2, Cronus rig clip, size 3/0 Cronus O’Shaughnessy hook, Cronus 60lb rig body line (clear), 30lb Sunset Amnesia snood line (clear). This rig is designed for beach fishing and other marks where species need to be targeted at distance. The hook is clipped down behind an impact shield making the rig streamlined as is cast through the air. This not only increases casting distances but also improves bait presentation as the bait is protected on impact with the water. A size 2/0 Cronus Black Aberdeen hook is fitted to this rig meaning that smaller species can be caught but the hook retains the strength to handle any larger specimens which may come along. A popular and useful rig for catching species such as bass and cod from the shore. Complete list of components used in this rig: Trace Builder size 1 (large) rolling swivel, Trace Builder size 6 (small) rolling swivel x 2, Cronus black rig crimps x 2, Cronus black rig beads x 3, impact shield, Cronus rig sequin, size 2/0 Cronus Black Aberdeen hook, Cronus teardrop link, Cronus 60lb rig body line (clear), 20lb Sunset Amnesia snood line (clear), Gemini neoprene stops. This rig is designed for fishing marks where casting to great distances is less important. This rig allows two baits to be used together and is ideal for targeting flatfish such as flounder from the beach or a range of species from piers and breakwaters. Size 1/0 Cronus Black Aberdeen hooks are fitted to this rig meaning that it can be used to catch a range of species and this rig is suitable for all-round UK sea fishing. Complete list of components used in this rig: Trace Builder size 1 (large) rolling swivel, Trace Builder size 6 (small) rolling swivel x 2, Cronus black rig crimps x 4, Cronus black rig beads x 4, Cronus sequins, size 1/0 Cronus Black Aberdeen hooks x 2, Cronus teardrop link, Cronus 60lb rig body line (clear), 20lb Sunset Amnesia snood line (clear), Gemini neoprene stops.